As our client base grows, adds complexity, and begins to embrace the elusive CRM strategy, your friends at GonzoBanker have seen increasing demand for software tools to measure and analyze the profitability of business units, products and customers. Why, we’ve even witnessed what could best be called paranoia from clients about being behind their peers in this area. But let me assure you that no matter how little profitability analysis your bank or credit union is now performing, you are not far behind the curve. If there is a technology project that has been less successfully implemented than bank profitability analysis, I cannot name it. Maybe data warehouse or the kiosk; perhaps account aggregation? Could be, but the volume of attempts to implement these systems is dwarfed by the number of banks attempting to run profitability measurement tools. Very few banks have even remotely approached this level of precision and tranquil acceptance. When you eventually tie incentives to profitability measures generated from a black box, you’re affecting people’s PAY – dollars – and not everyone is going to make more money when a new system is implemented. Doesn’t work that way. So the numbers get assassinated. Passive aggressive comments about the flaws in the system, the way it is applied, its assumptions, and the CFO’s intelligence float around the water cooler and hang heavy at the outdoor smokers’ nook. Without staff acceptance deep into the org chart, the reports generated from expensive profitability systems eventually become mere curios for the chest-thumpers in the Finance department. 70% of banks that utilize profitability analysis applications distrust the results. Only 15% of banks that undertake profitability analysis techniques utilize activity-based costing. Only 1% of all banks provide on-screen profitability information to the sales force. 98% of banks that utilize customer profitability analytics do so from the Finance department, but only 40% of these banks pass on the information to the Marketing department. Pet projects of politically powerful managers or business lines stay alive despite glaring numbers that show they’re bleeding money. Chronically unprofitable branches remain open. Unprofitable customers are almost never managed out of the bank, even indirectly through altering fees and rates over time. I’ll grant you that there are certainly short-term reasons to keep an unprofitable branch’s doors open or to give a red ink-laden product line a chance to survive. But with the vast majority of our clients, profitability information is rarely elevated past “Nice to Know” status versus evolving into a tool that inspires management to change operations or make decisions differently. It is all about Acceptance, Bubba. The problem is not in the systems themselves. There are some truly remarkable software packages managed by highly competent financial managers employing state-of-the-art funds transfer pricing and other analysis techniques. No, the problem is that profitability systems are typically perceived in the field as a black box in Finance, designed by people who have never had to sell anything. Add that to the fact that the data generated by these complex and expensive systems is rarely harnessed as designed, and 9 out of 10 banks call their profitability measurement and analysis process a failure. Early LOB Involvement – While the profitability bus is typically driven by Finance, senior line of business managers, maybe a handful or two of SVPs, are active in developing the rules of engagement – the funds transfer pricing bargain and SPECIFICALLY how profitability information will be distributed and utilized. Without early, interdepartmental debate and agreement that the rules are reasonable, fair and consistently applied, the system does not have a prayer. And to be clear, the FTP methodology and technical rules do not have to be rocket science. Proxies can be used to save time and money. You can spend $X to get 80% accuracy, and up to $3X or $4X to get to 95% accuracy. Just agree upon a core philosophy early in the game. The CEO should even stand in on occasion and serve as referee and judge to settle disagreements among the bank’s heavy hitters. Bean Counters Aren’t Salesmen – The line of business managers, not the CFO, must sell and explain the system to their team. They have infinitely more credibility with their own employees (and usually much better sales skills) than the Finance staff. Finance Is Switzerland – Finance doggedly administers the system according to the agreed-upon rules and fine tunes the system only after negotiating with the lines of business. Implement Slowly – A common thread among our success story clients is gradual implementation of profitability systems, starting with FTP and organizational profitability – with product and customer analysis done, at first, on a project-by-project basis. Then move to the relatively complex product and customer profitability analysis as the bank becomes more comfortable with the process and gains expertise in the software package. Gutsy CEO – Though listed as #5, the single most important facet of a successful implementation of a profitability system is a CEO who will be a vocal advocate of the entire process. By this, I mean the bank must have a CEO who will enforce the system and is unafraid, proactive even, in staring down senior managers and telling them, “These are the rules. There are imperfections, and I’m open to suggestions to make it better. But in the mean time, live with it. Work the system as hard as you like, but know that it’s here to stay.” It all comes down to the pay check in the end, and that is always an emotional subject. The CEO who doesn’t blink, who is unafraid to be seen as the Angel of Mercy by some and the Harvester of Sorrow by others is the key to making the process work in the long term. Shake What Your Momma Gave Ya – It should go without saying, but the banks that employ best practices for profitability measurement actively use this information that they have spent so much time and money producing to make better decisions. Once up and running, the home run hitters establish a formal but simple set of benchmarks that are tenaciously followed every month or quarter. 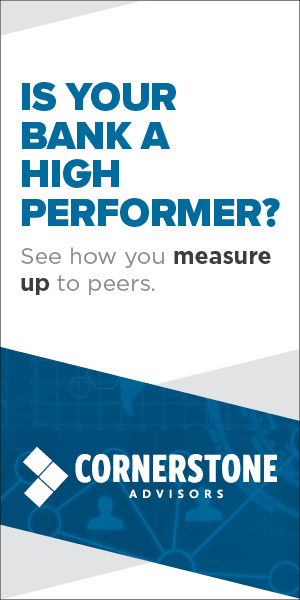 These benchmarks become the performance measurement mantra at the bank. Every employee knows about them and can quote those that affect them. They are actively used in making decisions about retaining/shooting business lines and products. When the commercial lenders are comparing portfolio profitability numbers between Jagermeister shots at the strip bar after work, you know you’re headed in the right direction. Obtaining the right profitability analysis systems and smart people to manage them is difficult, but that is the tip of the iceberg. Navigating the intangibles is what will get your institution ahead of the curve.